Edward Clark Estates in Grays are already renowned for our pro-active, forward-thinking approach. Striving to consistently deliver oustanding results, we continually embrace development and change in the industry with modern enhanced technology. Indeed, we aim to exceed the expectations of our clients — from the energy and enthusiasm of our highly motivated team to the quality of our marketing materials. Much of our business comes from first-hand personal recommendations: it’s our level of service and commitment, our attentiveness to the smallest of details, and our proactive approach that truly sets us apart from our competitors. At Edward Clark Estates Director Clark North undertakes all market appraisals and the key to selling your property whether it is a studio flat or a large country home . When we first visit you, you'll receive an individual property marketing review which shows you what steps you need to take to get your property sold and to achieve the best possible price. You'll also receive a carefully researched, honest valuation of your property based on comparable properties for sale and currently under offer. Your review shows how we have determined the right marketing price for your property. You will not be given an over inflated valuation to attract your business. Any fees will be discussed with you right at the beginning so you will know precisely how much you will pay for our Excellence Competitive Effective first class service. 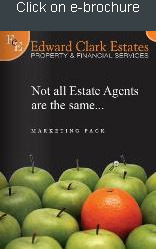 Edward Clark Estates are not content to rest on the laurels of our combined years of experience – instead we strive to ensure that our customers are delighted and that their experience of selling, buying or letting a home through Edward Clark Estates will be second to none and make it as stress-free and effortless as possible. Edward Clark Estates understands knowledge, skill and expertise to negotiate the sale of your property through to completion and we know from experience that in the UK a large amount of property sales fail to reach completion that’s why our in house sales coordinator will be with you every step of the way.